1. How does God have fellowship? 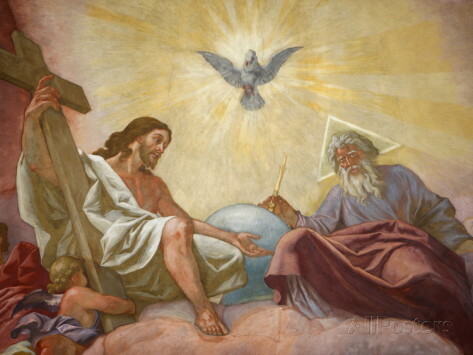 He can learn nothing from the other members of the Trinity—meaning that he can learn nothing from himself. Nor can he have fellowship with the angels, because they, like us, are not his equal. We can love our pets and even engage them, but we cannot have fellowship with them on an equal level. Moreover, we cannot verify if the angels have the same free will that has allegedly been given to us humans, so how could we possibly know if they are even free to have their own thoughts? Wouldn’t all of this make God the loneliest entity in existence? He has no respected colleague, no equal, no one on his level to whom he can converse freely. Imagine being the only one of your kind in existence. 3. Does God wonder if he has a Creator? Since God obviously knows himself pretty well, does he observe that he is the most remarkably complex object he has ever seen? Does he look upon himself much like we look at the Universe and wonder how something so complex and so infused with obvious design could have come to be without a designer? Sure, you could say that God couldn’t possibly wonder something like this because he is all-knowing, but does this mean he designed himself? Is his complexity the product of his own complexity? He must surely know, right? And yet it would constitute a paradox to suggest that the Creator created himself. So, shouldn’t he, theoretically, be questioning his own origins much like we question ours? If we can look at ourselves and infer that we must have a designer, cannot God too look at himself and infer that he must have a designer? Should we deny him the curiosity that is so blatant within our own existence? 4. Does God look around and wonder why he is alone? Say he’s up in heaven and taking stock of his surroundings. Does he observe that he is alone? That there is no one on his level competing with him? That nothing else exists other than him and the things he has created? Wouldn’t it be an endless torment to spend an eternity with nothing but yourself and the objects you have brought into existence? If you existed with nothing but your created robots and a pack of wild dogs for the rest of your days, wouldn’t you begin to question the quality of your life? Just some stuff to chew on.